Halloween is around the corner and to be honest I don’t celebrate this holiday with scary parties or costumes, but I love to make Halloween cards with different colors and non-traditional images and this is one of those. To create this card I used some sprays from Imagine that you will love! The process of this was very simple. I took a piece of whisper white cardstock and a background stencil. 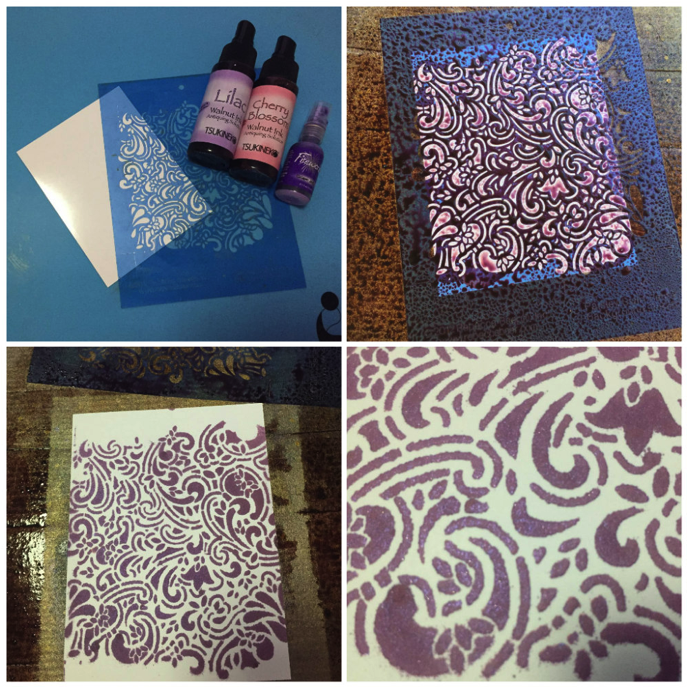 I selected Paisley Swirl Petite from Rebecca Baer Collection and sprayed the free areas of the stencil with three different sprays from Imagine. First I used Cherry Blossom Walnut Ink, then I applied Lilac Walnut Ink and the last one layer was with Fireworks Grape Jelly to accent the color and give it a little shimmer. I removed the stencil and washed with warm water while the paper totally dried. It doesn’t take long. Next, I die cut a spider several times using Tangerine Tango cardstock and stacked them together using On Point Glue. 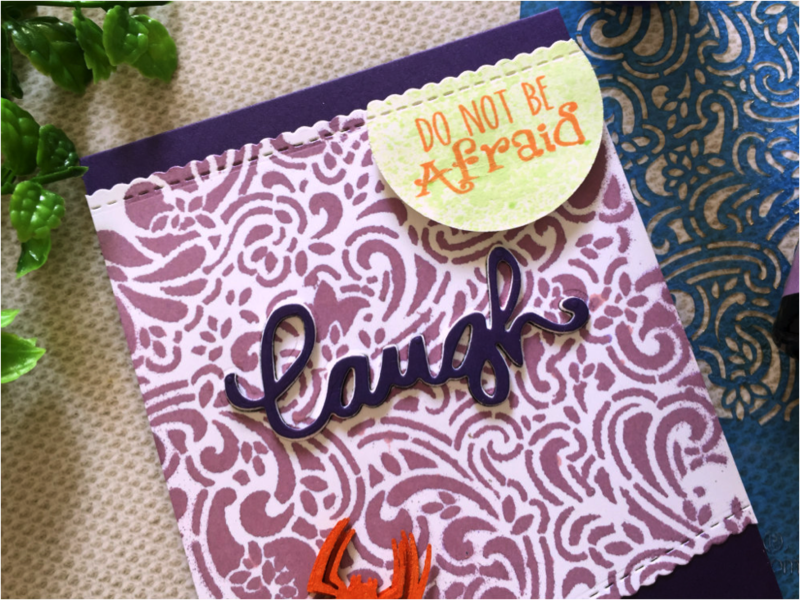 I sprayed the spider die cut with GooseBumps Shimmer – an acrylic texture spray with fine shimmer. It helped to create a special effect of texture and at the same time, it is shimmery. To finalize the card, I cut the borders of the stenciled piece using an MFT Die-Namics Stitched Scallop Basic Edges. Then I cut the word “laugh” from the center of this layer using a die cut from the Little Yellow Bicycle. I used a very fun inlay technique with a twist. Die cut the same sentiment one time on fun foam and one time on elegant eggplant cardstock and adhere together. Now adhere into the negative on the card. Having the inlay that actually pops forward is visually appealing. As a final touch, I stamped a complement sentiment “do not be afraid” using Memento Tangelo Ink and sprayed with Fireworks New Sprout. I cut it with a circle die and then with the same scallop stitched border that I used on the stenciled layer. Hope you enjoyed this tutorial. Please like, share on Facebook or leave a comment below. This entry was posted in Cards, DIY, INSPIRATION, Martha Lucia Gomez, PROJECTS and tagged cardmaking, Die Cutting, DIY Inspiration, Fireworks Spray, Halloween, Handmade, Memento, On Point Glue, Paper Crafting. Bookmark the permalink. That’s a great card ! !